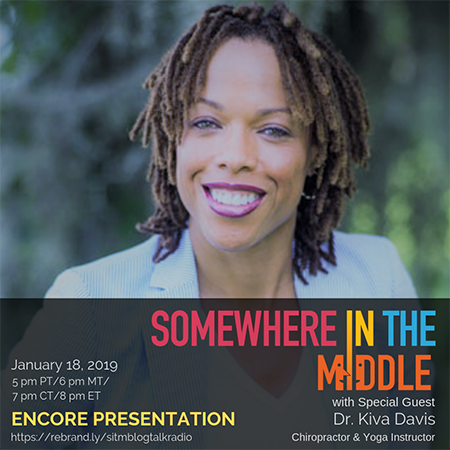 Dr. Kiva L. Davis, DC is a licensed Chiropractor, with a strong background in Anatomy and Kinesiology, and is a registered Yoga Alliance E-RYT® 200, YACEP® teacher. Dr. Kiva’s approach to anatomy and yoga is lighthearted and passionate. She has practiced Yoga for more than ten years. Her introduction to Holistic health was in 2003 when she received a certification in Reflexology. She became interested in Yoga after taking a class at a local gym in the late ’90s. Her desire to deepen her understanding of the practice resulted in her obtaining certification to teach from Yoga Lotus in 2007. She completed more than 700 educational hours in Hatha Yoga at Yoga Lotus, Kemetic Yoga, and Rocket Yoga. Dr. Kiva considers herself the "happy" yoga teacher and is known for her engaging style and ability to share concepts in a clear and accessible way. As her students move through asanas, she wants them to experience the movements and the freedom that can be obtained. She compares yoga movements to dance. She conducts Anatomy training for several Yoga Teacher Training programs and she is certain that a strong foundation in anatomy gives teachers advantages in class development. Kiva believes strongly in bringing humor to her classes and training while still respecting the practice. Her mission is to empower students and teachers to move beyond perceived limitations to find freedom, confidence and to allow energy to flow through their bodies. Dr. Kiva is a graduate of Texas Southern University with a major in Psychology and minor in Art History and received a Doctorate Degree from Texas Chiropractic College. She is enrolled in a 500-hour yoga program and a Chiropractic Diplomate Program in Nutrition.